Australian investors who want a diversified portfolio in a particular asset class without having to manage it themselves are able to Exchange Traded Funds (ETFs) on the ASX. 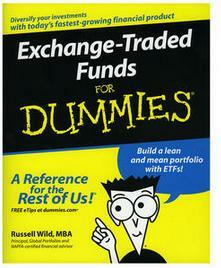 ETFs are exchange traded on the ASX. That means you can buy and sell them on the ASX just like shares. They trade and settle in exactly the same way as any other shares on the ASX. You can buy them through your broker or online trading account and the main benefit is that they allow you to buy yourself, on the ASX, exposures to markets and asset classes that were previously inaccessible without opening broking accounts with international equity and futures brokers. You will also no doubt be aware that other diversified portfolios are also available on the ASX through LICs (Listed Investment Companies), we wrote about them yesterday – CLICK HERE. By comparison the LIC market is a rather small domestic Australian affair whilst the ETF sector is much larger market globally (not domestically) and globally it is the plaything of the much bigger international investing community. There are around 177 ETFs listed on the ASX. 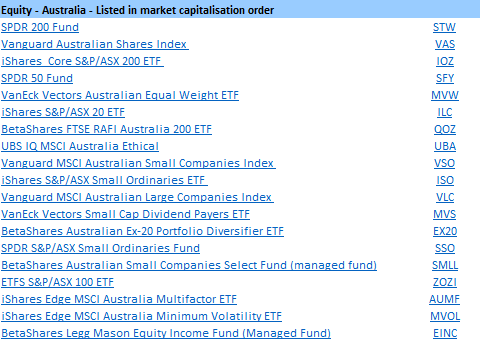 Some of them are the Australian listing of some very large international ETFs. Add them all up and they have a market capitalisation of $998 billion although that includes the big internationally listed ETF listed on the ASX. 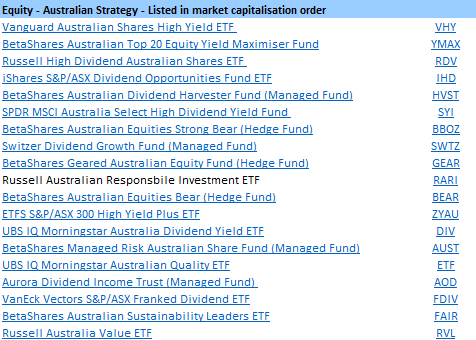 If you just look at Australian focused ETFs there are just $18.24bn worth. Most of the biggest ETFs are not investing in Australian shares with the biggest ETF listed in Australia being the SPDR S&P 500 (SPY – market cap $345bn) which represents the S&P 500 and the second biggest being the iShares S&P 500 ETF (IVV – market cap $200bn). These can be used by Australian investors to diversify internationally. Many of the ETFs listed here are listed on other exchanges, they just happen to be listed here as well. For a list of all the Exchange Traded Products (as well as the LICS) Click Here for my spreadsheet – it includes links to the individual ETF descriptions where available. You will need Microsoft Excel. The bulk of ETFs are issued by major US players, iShares, Betashares, BlackRock, and State Street with Russell Investments, Vanguard, UBS and Van Eck the other bigger players. The major segments of the ETF market include Australian ETFs, International ETFs, Commodity ETFs, Fixed income ETFs, Currency ETFs, Cash ETFs. Without going into it, some ETFs are ‘Physical’ and some are ‘Synthetic’. There are different risks with both. Standard or 'physical ETFs' buy the underlying investments (such as shares and other assets) on the reference index that the ETF is seeking to track. If you invest in an ETF, you won't directly own the underlying investments, the ETF will own these, you will own units or shares in the ETF. Your main investment risk is the performance of the underlying shares or other assets. Other risks are discussed below. Synthetic ETFs have a material exposure to derivatives as well as the underlying assets that the ETF is seeking to track. Along with the benefits and risks of physical ETFs, synthetic ETFs have additional risks such as the credit risk associated with the derivative counterparty. Some products that also track an index or other investments may 'look and feel' like ETFs, but they are not ETFs. Products labelled 'exchange traded commodities', 'exchange traded notes', 'exchange traded certificates', and 'exchange traded securities' are not ETFs. There are also Active ETFs, sometimes referred to as exchange traded managed funds and exchange traded hedge funds that, unlike passive ETFs, do not simply track an index. They may use strategies to try to outperform an index or seek enhanced returns. The risks of these products can be different and sometimes much higher than the risks of ETFs. Liquidity is often an issue although some are so highly traded there is no issue. I will list some of the quoted benefits and risks of ETFs lower down but their popularity is overstated in Australia. It is a tiny market here ($18bn of Australian focused ETFs is just 0.1% of the ASX 300 market cap). It’s certainly growing but it is way behind managed funds ($2.8 trillion) and way behind ETFs in the US and LICs in Australia. It appears to be a thriving giant of an industry over here because the firms that are marketing them in Australia are huge companies for whom their Australian presence is subsidised by their international ETF business. The main attraction of ETFs for me would be for people who have given up on the volatility of shares. Instead you might choose to simply trade ETFs. It’s a lot easier making a few decisions each year about which country and currency to be in than it is managing the volatility, decision making and paperwork on twenty separate equities. In the ETF world your investment concerns boil down to timing asset allocation rather than managing events in individual shares which is more risky, volatile and tough to manage. Talk to some traditional stock brokers and they will tell you that, for them, trading shares is now a poor man’s game. Transaction broking is not a reliable business and they need to do something more “wealth management” and fee orientated that starting each day with a blank book looking for excuses to make clients trade. Some brokers now tell clients that the real way to manage big money is not picking individual shares but managing asset allocation across asset classes although I can tell you, asset allocating instead of stock picking would bore you with its lack of action and volatility. It will however suit anyone who is feeling that “There must be a better way” to avoid the volatility, profit warnings and stress of managing an individual shares equities portfolio. Trading ETFS, or managed funds, or LICs alone involves creating a portfolio that times markets and asset classes rather than picks stocks. This is the ETF industry's best pitch in my opinion. “Stock picking is too hard, buy ETFs” would be my catch phrase if I was in the marketing department. With ETFs and LICs you can do what a lot of financial advisers do, assess your risk profile then direct your money into asset classes, international markets, cash and fixed interest through ETFs or LICs. But don’t think that’s all there is to it. To truly get ETFs and LICs (or managed funds) right, there is still a job for you to do. As an asset allocation style investor the returns comes not from buying diversified or specific ETFS (they simply reflect an asset class that can go up or down), the value comes from timing the asset classes, timing your exposure to the markets. Sure you can buy and hold, but if you want to protect yourself from market risk, from a crash, from a GFC, you still have to pay attention and time the markets just as you would time a stock. The good news is that an ETF over an index is like stocks in slow motion. You have much less volatility (more sleep at night) and more time because you are not having to check in on a daily basis. Buying the big diversified passively managed ETFs over markets and major asset classes are for those that want a quieter life. One of the main attractions of ETFs is that the fees are lower. We list the MER (Management expense ratios – fees) on the MT spreadsheet. They range from 0.07% to over 1%. This is significantly less than the 2% plus you can get charged in unlisted managed funds. Of course you’ll be paying a commission in and out. Then there’s the spread. Then there’s the premium or discount to NTA. It all adds up again. You do not treat ETFs like shares when it comes to trading. They do not respond in the same way to “demand”. You cannot pressure a passive ETF up by putting phantom bids or offers on the screen. ETFs will reflect the underlying asset, not your buying or selling. ETFs are open-ended with ‘synthetic liquidity’ meaning units can be cancelled or created in response to market demand by the ‘market maker’. The funds have two levels of liquidity – the level seen on screen and also any units cancelled or newly created in response to daily demand or supply. This enables the ETF to consistently trade at, or close to, Net Asset Value. Liquidity is maintained by the market maker until such time that the fund has volume to maintain natural liquidity. The market maker is appointed by the EFT issuer (such as Vanguard) to act as an intermediary between buyers and sellers and create or cancel units as demand requires. Brokers have the option of contacting the market maker over the phone to negotiate a price on large orders. This protects them from entering a high volume of units to the market pushing out the spread. Capital gains tax applies to ETFs in the same manner as LICs. Dividends may be reinvested depending on the particular fund. Exchange traded funds (ETFs) and managed funds (MFs) are typically registered managed investment schemes (MIS), SPs typically represent contractual obligations of the issuer. Investors in an ETF structured as a MIS hold units in a unit trust rather than shares in a company that operates the investment fund. Each unit represents an interest in a portfolio of assets held by the ETF. Alternatively for structured products (SPs) which represent contractual obligations of the issuer, investors may not receive an interest in the portfolio of assets held by the SP but instead rely on rights against the issuer of the SP under the terms of issue of the SP. ETFs are typically passive index tracking investments and in most instances are either physically backed or adopt a representative sampling approach. ETF issuers may also alternatively choose to synthetically replicate the performance of the assets that they seek to track. Such ETFs can carry specific risks and would be identified as they are required to have the word ‘synthetic’ as part of their naming convention. Specific details regarding the risks of synthetic ETFs is available. Managed funds, that are considered part of the ETF family, can include actively managed as well as passively managed forms of investments. These managed funds can be constructed to achieve a certain outcome such as the BetaShares BEAR fund that is designed to generate returns that are negatively correlated to the returns of the Australian share market (as measured by the S&P/ASX 200 index). Managed fund issuers may choose to synthetically replicate the performance of the assets that they seek to track or outcome sought to be achieved, rather than being physically backed or adopting a representative sampling approach. Such managed funds can carry specific risks and would be identified (if they were available on ASX) as they are required to have the word ‘synthetic’ as part of their naming convention. Specific details regarding the risks of synthetic managed funds is available. Structured products typically do not invest in the underlying securities/asset but rather they aim to replicate the performance of the index or benchmark synthetically. There can be many reasons why a product issuer will choose the synthetic replication approach. Most commonly it’s because it is impractical to invest and hold the physical security notably when the underlying security is a commodity such as wheat or oil. Synthetic replication is done by holding financial instruments, most likely a futures contract, to simulate the investment performance of the index or benchmark for the whole fund. More information on the specific risks of structured products is available. 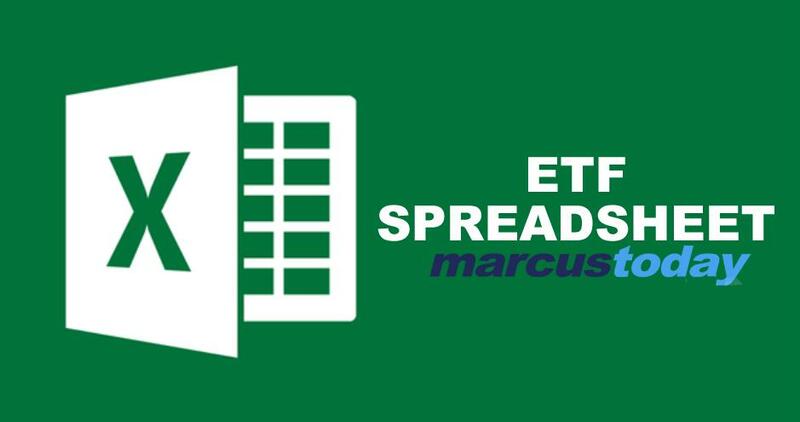 You will find a host of other information and marketing on the issuer websites but the best start perhaps is our spreadsheet which links through to descriptions of each ETF. Buy/sell flexibility. ETFs are traded on the ASX and this means that you can buy and sell during ASX's trading hours. This means you can enter and exit an investment in an ETF as you would a share with a corresponding three day settlement period. Diversification. ETFs can help you diversify your portfolio across markets or asset classes that otherwise could be difficult for investors to access. For example, there are ETFs that cover emerging markets, specific market sectors, government and semi-government bonds, commodities and currencies. Lower cost. ETFs are typically able to achieve lower operating costs, the management fees (commonly referred to as MERs or Management Expense Ratios) can be significantly lower than other forms of professionally managed investments. Returns from capital appreciation and income. ETFs will change in value as the underlying asset or assets change in value. Depending on the type of product and the benchmark being tracked, investors can earn returns through capital appreciation and/or distributions. Investors may also enhance after tax returns from franking credits. Fair value. ETFs are designed to ensure that they trade close to their underlying value. This provides the investor with certainty that the on-market price will closely reflect the value of the underlying assets held in the ETF. This is commonly referred to as trading at net asset value (NAV). Taxation advantages. The turnover of the underlying portfolio tends to be low with the constituents of equity ETFs changing only when there is a rebalance of the index. This means that the level of capital gains tax that needs to be paid by the fund and its investors can be greatly reduced. Market risk – market conditions (for example, lack of liquidity) may make it difficult to buy or sell ETF in certain circumstances. Tracking error – the return on the portfolio may deviate from the return on the index or benchmark tracked. Exchange rate fluctuations – ETFs which seek to achieve the same return as a particular overseas market index or benchmark, and are traded and settled on ASX in Australian dollars, may be exposed to additional risks. If the ETF is not hedged against currency risk, fluctuations in the exchange rate can affect the value of the portfolio. Additionally, there may be political risks in the home country of the overseas market or benchmark which may also affect the value of the portfolio. Taxation outcomes – there may be different taxation outcomes for investors in synthetic ETFs when compared with direct replication ETFs, depending on whether any gains or losses in the ETF are achieved through holding the assets that make up the index or benchmark or are achieved through the derivative exposure. Any different taxation outcomes may significantly impact the effective return for investors. Use of derivatives and counterparty risk – ETFs that use derivatives could cause the ETFs to incur losses. Some ETFs for example may use over the counter (OTC) derivatives, which are not subject to central counterparty clearing arrangements. Central counterparty clearing arrangements, where available, help to mitigate counterparty risk. Diversification – SPDRs provide investors with the ability to gain diversified exposure to stock markets through one transaction. i.e. SPDRs generally give investors exposure to the securities that make up an index. Therefore, by investing in SPDRs, investors can achieve diversification as if they owned many different securities. Low Cost – SPDRs are designed to be cost-efficient. As an index investment, they can have the advantage of being less expensive to operate than actively managed funds, and therefore typically have lower management costs. Management costs are increasingly important to both individual and institutional investors because they can have a significant impact on a portfolio's return and investor's potential for wealth accumulation. As the majority of trading is generally conducted through the stock exchange, there can be fewer internal costs associated with operating an ETF versus a typical unlisted indexed managed fund. Transparency of Performance – Index investments are designed to inherently replicate the performance of the underlying index (often before fees and expenses). This is achieved by purchasing securities generally in accordance with their weighting in the index and provides investors with transparency of performance. Tradability – With traditional unlisted managed funds, investors may only be able to subscribe for or redeem units at unknown prices (i.e. at prices calculated after the request is made). In contrast, SPDRs can trade on a stock exchange throughout the trading day. This can provide investors with more flexibility, allows them to determine when they want to transact and affords greater price transparency. For those of you not aware, most international ETFs (iShares for instance) are US domiciled companies and when they pay a dividend to an Australian investor the dividend is taxed at 30% (withholding tax). You can halve this by signing a form and giving it to the share registry (Computershare for iShares ETFs). The form lasts for 3 years then has to be re-signed. So effectively you are taxed 15% on an international ETF’s dividend. This goes as a tax credit for anyone paying tax in the US but no-one is so it’s effectively lost. One Member emailed me asking , does the tax on International ETF dividends make ETFs not worth investing in. The answer to that is no. The US withholding tax is not really a big factor. You are using ETFs for all the benefits of ETFs including things like getting a diversified international equities exposure in one ASX listed entity and getting money out of the A$ (all ASX listed iShares ETFs are unhedged). The fact that 15% of the income which is 15% of 2.35% in the case of IOO.AXW or 0.35% per annum is almost irrelevant. It can move over 1% a day – 0.35% a year is not a driving factor in ETF decision making. So you can see the tax issue, whilst concerning on paper is immaterial in the decision whether to buy an ETF.